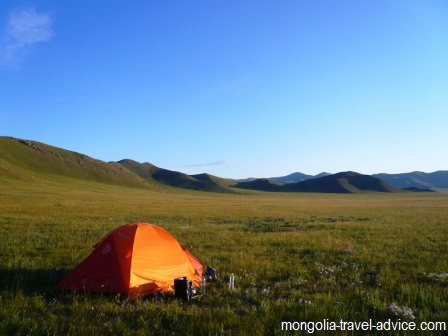 Central Mongolia is what most foreigners think of when they imagine Mongolia: rolling hills, carpeted with lush green grass, with horses, yurts, and a big blue sky. 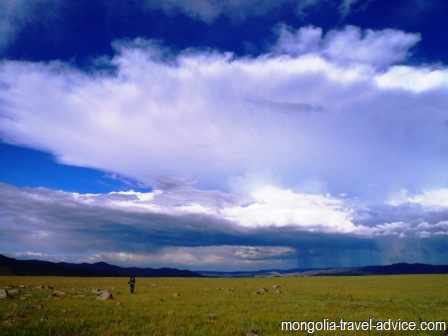 With a few popular attractions, and only a short journey away from Ulan Bator, Central Mongolia is a popular choice for travelers. The whole region is spectacular, so just pick a river valley or a remote looking track, and start exploring! 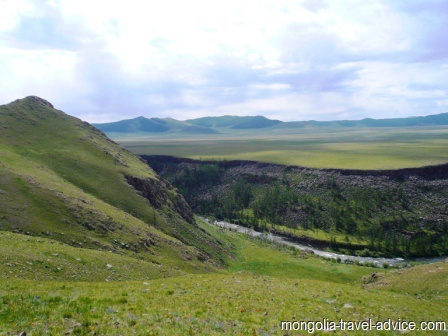 The vast valleys of Mongolia's center. Sometimes you can see 3 or 4 separate storms at once. The ancient capital of Karakorum was the capital of the great Mongol empire. For a short period, Karakorum was the centre of the world's greatest empire, falling under the reign of Genghis Khan's son Ogodei, and grandson Mongke. Once Genghis' other grandson Kubilai became Khan, he moved the Mongol capital to Beijing and Karakorum entered a period of long decline. Very little of the ancient capital remains today, but many of its stones were used to build the Buddhist monastery of Erdene Zuu. A trip to Karakorum these days reveals little sign of the place's rich history and former glory; so I probably wouldn't advise going too far out of your way to get there, but many still go there because of its proximity to Erdenne Zuu. <p>White Lake, or Terkhiin Tsagaan Nuur is one of the prettiest lakes in Mongolia, rivaled only by Lake Khovsgol in Northern Mongolia and Khoton Nuur in West Mongolia. Terkhiin Tsagaan Nuur National Park is a popular site for hiking and horse treks, and includes the Khorgo extinct volcano. You will find it relatively more touristed than Khovsgol, but hey, that's what you get for having it so close to UB. White Lake is about a 2-hour car trip from Tsetseleg. There's a small-ish village called Tariat which is quite close to the lake, Tariat has shops selling basic food stores, and a few guesthouses for foreign tourists which I'd think stay pretty empty 99% of the time. Most people will want to buy a couple of things in Tariat and then go down to the lake and camp there for hiking or horse riding. If you're traveling without a tour guide you should probably be able to find horses and a guide in Tariat. Tsuman river valley, near White Lake. Tsetserleg is the popular jump-off point for trips in Central Mongolia. As far as Mongolian regional cities go (and the standard is low) Tsetserleg is one of the best. More importantly, it is surrounded by some beautiful countryside, and you don't have to go far to see Central Mongolia in all its glory. Visit my page on Tsetserleg for details on accommodation, restaurants, and things to do. Camping about 50km from Tsetseleg. Coffee on the stove; a nice sunrise to wake to! 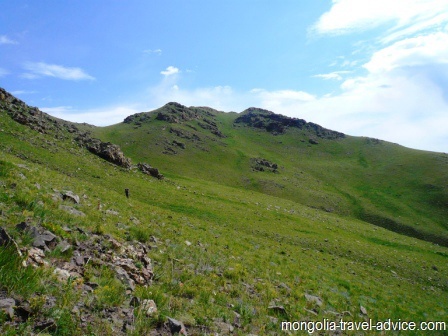 Khustai Nuruu national park is a good stop-off on the road between Ulan Bator and Tsetserleg. 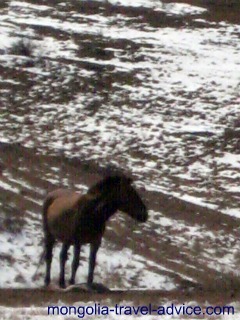 It is the only place in the world where the magnificent Tahki wild horses still roam freely. A Tahki horse at Khustai Nuruu. The bundle by it's feet is actually a young foal, just born. 50m is about the limit of range for my pocket camera.